Location: 1½ km E of Templeton village, 100 m N of the A4115, reached by a gated driveway. The Baptists came into being at Molleston in 1667, according to the Baptist Handbook, as a branch of Rushacre, Narberth, the first Baptist meeting place in the county. The Molleston branch is believed to have met at first in a farmyard loft at Roeside. The chapel is a building of mid-C18 origin, the date 1731 being displayed on the E-facing front gable. This, however, is the date of the local formation of the church: in 1736 the Rev. Evan Thomas became its minister, and some time later under him the building was erected. In 1754 Thomas George of Molleston Farm was granted a 999-years lease of the site from Daniel Poyer of The Grove, at 3s 6d (£0.17 )per annum, and paid for the construction. Under the will of John George in 1799 the chapel was devised to trustees for the purpose of public worship by Protestant Dissenters called Baptists. The present building is much altered from the C18 original. It was enlarged in 1842 and renovated in 1883, as stated on the front gable. Indications of alteration are that the N side wall is thicker than the S side wall; there is a blocked former doorway in the N wall, near to the front corner; and there is a discontinuity in the masonry of the S side near to the rear corner. The present interior and exterior design may be taken as completely renovated in 1883. The Chapel has a baptismal pool, replacing the original open-air pool which was 50 m to the E in what is now the graveyard. A kitchen has been added. Very plain exterior, with front gable facing E (SE). Slate roof. Rendered with plinth and rusticated corners, decorative band around openings and name-plaque, barge-boards and simple wrought-iron finial. Single round-headed window above a round-headed doorway. The window has coloured margin glazing, and its main two panes trefoil-headed. The doors are panelled and set deeply in the wall thickness. At the sides are three tall round-headed windows. Internal anteroom with symmetrical stairs to the gallery; two doors lead to the chapel. Chapel layout with three main blocks of pews and three-sided gallery. Removable floor above the baptismal pool. The pulpit has two flights of stairs, with joinery in gothic style. Large carved timber and brass lamp standards on each side of the reading desk. At the rear of the pulpit is an arched recess with moulding and brackets. War memorial plaques at either side. The gallery is carried on decorative cast iron columns. The front is carved with intricate fretwork and carried forward of the column line with deep narrowly-spaced brackets. Raking seats in the gallery, with posts at intervals which were formerly used as standards for gas lamps. Other gas lamps were located at column positions at the front of the gallery. 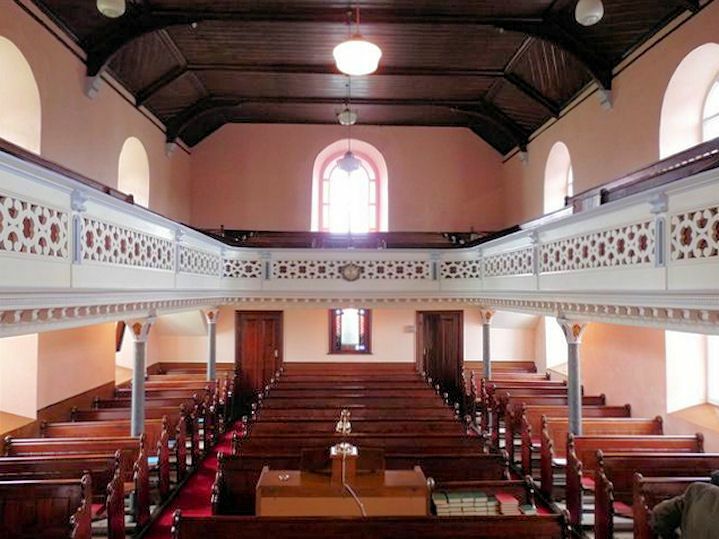 A chapel with C18 orgins, remodelled in 1883 with good quality interior design and detailing. Reached by a private lane 500 m N of Molleston Cross, W of the road to Narberth.